La Comtesse enters play insane. Response: After La Comtesse is restored, ready her and discard X cards from your hand to discard X cards at random from each opponent’s hand. Then, each player draws X cards. 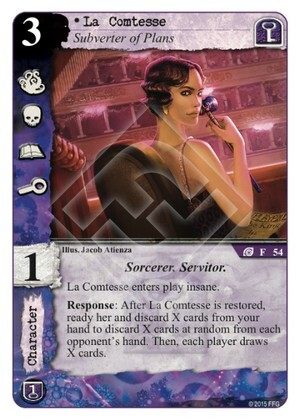 The issue with La Comtesse is that she subverts your plans almost as much as your opponent's. Yes you choose your discard and the other guy doesn't, but you still have to offload cards... and hope your upcoming replacement draw will be better than his. Add poor skill figure to the mix, and I'm afraid she's a 1/5. This is a great card. It does everything that Yog wants to do, and it does them all well. Filling your discard? Check. Filling your opponent's discard? Check. Drawing cards? Check. Relevant subtypes and icon diversity? Double-check. The main 'weakness' I see with the card is that it has a Terror icon, so you can't easily repeat her ability. If you could, this card would be broken. I love cards where they have to make it better in order to make it worse, and this one fits the bill. I'm somewhere between the 2 reviews above. I think she could be very nice in a Yithian deck where you can just cheat cards to discard then get all sorts of triggers, but otherwise am not too sold on the ability. The icons and skill for cost are fine as an overall package. All in all it amounts to a card I'd consider in a deck with Yithians or Tesla - which at the moment pretty much would require a change to the restricted list. Without that she isn't worth it. 2/5, up to 3 if Oracle, Scout, or Tesla is unrestricted. She's a decent card. Good icons for her cost (though low skill) and the ability to (maybe) mess up your opponent while replacing cards you either don't need right now or want to seed your discard pile with in order to set up a future move. Don't rely on her ruining your opponent's plans though, chances are they're going to discard something that doesn't hurt much or will replace it with something approximately as good. Rather, plan to seed your own discard pile and include cards that will benefit from that.